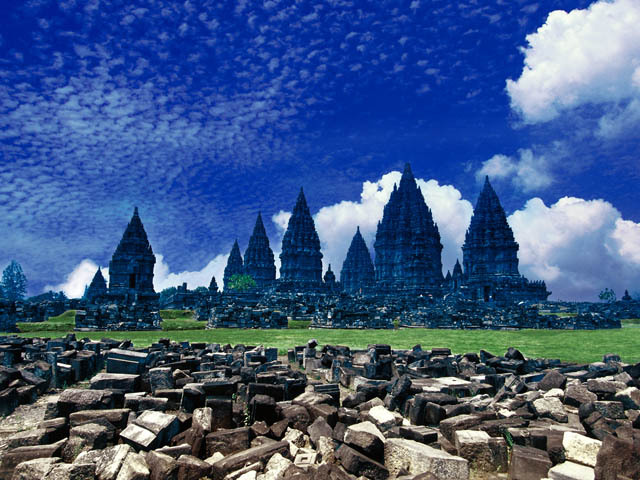 Prambanan is the ruins of a Hindu temple complex located 17 km east of Yogyakarta, along the Yogya-Solo highway. It’s one of the two UNESCO World Heritage Sites in Yogyakarta. As it is sitting on a volcanic plain, the Prambanan complex is actually vulnerable to earthquakes as well as volcanic eruptions. Prambanan was completed around 856 AD, to commemorate the victory of Rakai Pikatan, of the Sanjaya Dynasty, over Balaputra, the ruler of the Sailendra Dynasty. (The Sailendra Dynasty is the one attributed for the construction of Borobudur, so the two monuments were built no more than a century apart – however Borobudur is a Buddhist monument while Prambanan is Hindu). Balaputra fled to Sumatra, where he became the ruler of the Srivijaya empire (the same empire that eventually produced Parameswara, the Sumatran prince who established Malacca). Like Borobudur, Prambanan was deserted within a few years of its completion. Archaeological speculation attributed the eruption of Gunung Merapi in 1006AD as the likely reason for the civilisation to come to such an abrupt halt. The eruption covered the region with such a heavy blanket of volcanic ash that it buried the monuments and caused widespread famine, compelling the population to move elsewhere. The Prambanan complex consists of eight main buildings. These are Hindu sphire-shaped shrines called candi. The three largest ones are arranged from north to south, and faces the east. The biggest and most magnificent is the middle candi, which rises to a height of 47 m (155ft). This is Candi Siva Mahadeva, dedicated to the Hindu deity Siva. Flanking it are slightly smaller shrines, Candi Vishnu to the north and Candi Brahma to the south. To the east of these three shrines, and facing them, are three smaller shrines. These are the temples of the celestial vehicles of the three aforementioned deities – nandi, the bull, for Siva; hamsa, the goose, for Brahma; and garuda, the sunbird, for Vishnu. In addition, there are two court temples which are located by the northern and southern gates. Due to its east-facing orientation, Prambanan is best viewed on the morning part of the day, so that the rising sun can illuminate the front portion of the main temples. The largest shrine of the complex, the Candi Siva Mahadeva, is also known as Loro Jonggrang, a folk name that is often used to denote the entire temple complex. (That’s because the name Prambanan refers also to the town in which the complex is located.) The name Loro Jonggrang means “slender maiden”, and it is derived from a local legend which is “superimposed” on the ruins. In the legend, a maiden, who happened to be a Javanese princess, was wooed by a suitor that she isn’t interested. To win her hand, she gave him the Herculean task to build a thousand temples within one night. The man used magical powers to call on genies to help him with the task. So the genies started putting up temples in the night. However, she has no reason for him to succeed. When it appeared certain that a thousand temples would be completed, she sabotaged him by pounding the rice mortar, confusing the genies into thinking that dawn is arriving, and causing them to flee. By then 999 temples had been built. Enraged by her action, the man built the final temple. And then he issued a curse on the maiden, which turned her into stone. Local belief identify her as the statue in the northern chamber of the temple. What is interesting is that the statue identified as Loro Jonggrang is actually that of Durga, Siva’s consort. Hence, the local people, who have long discarded Hinduism, have lost their understanding of it, and have reproduced their own tale to explain the figures within the Prambanan temple. Just as with Borobudur, the Prambanan temple continues to inspire visitors with its mystical charm long after its builders were gone.